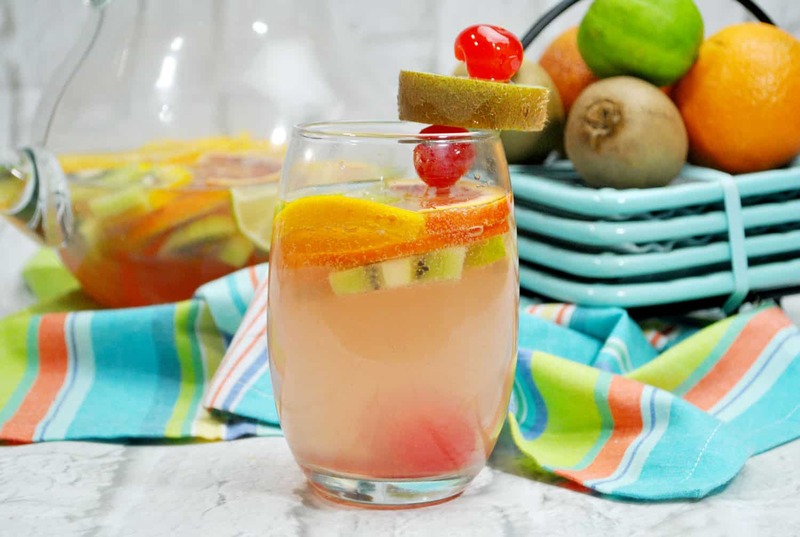 If like most people, you are enduring what feels like the longest winter on record, this Tropical Fruity Sangria recipe has come to your rescue. Making and sipping on this easy and tasty concoction will have you feeling like you are sitting on the beach gazing at a sunset and listening to waves crashing on the shore. Ahhh. I bet you feel warmer and more relaxed already. It’s so darn easy!!! Sure you have to slice some fruit, but the rest is like making one of those fun “dump” cakes; just pour it all in a big bowl, chill and enjoy. It’s different than your typical sangria. It has pineapple rum in it! You can’t read, say or smell pineapple rum without thinking of the islands. And, white wine sangria recipes taste and feel light and refreshing on the tongue. An entree like Tilapia Fajitas. A spicy appetizer like chips and Sweet Corn, Tomato and Avocado Salsa. Firstly, don’t break the bank. Choose a wine that you enjoy, obviously, but remember that you’re using it as a base and are going to add plenty of other fun flavors to it, so no need to go fancy. We recommend a sweeter wine here, but for those of you with less of a sweet tooth, a wine with a crisp drier side like a Pinot Grigio or Sauvignon Blanc will also work well. 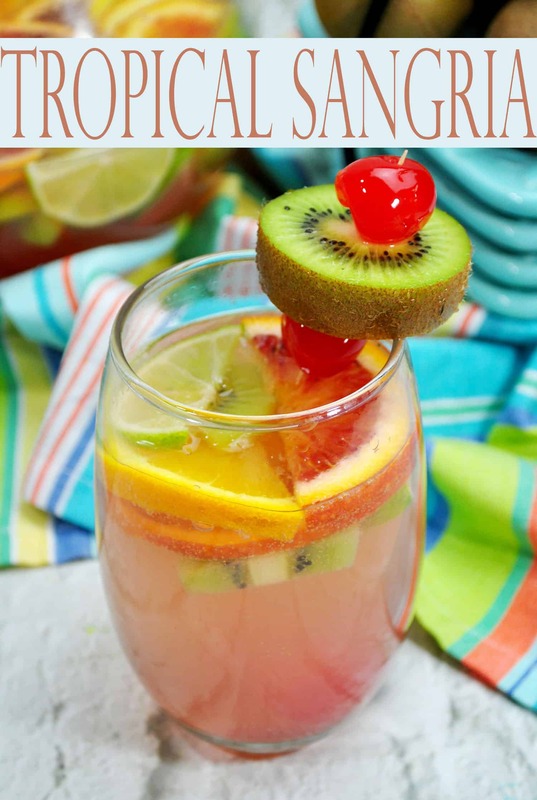 This refreshing fruity sangria recipe tastes delicious the minute it is chilled, however, if you have time and patience, it will be even more flavorful if the flavors marry together for a few hours or even overnight. Pour the fruity sangria over ice just before you are ready to serve. That way it will be cold and refreshing but won’t get watered down. For a fun twist, instead of ice cubes, slice and freeze some extra fruit. When ready to serve the sangria, put some frozen fruit in first! This is a colorful, creative way to keep it chilled. Looking for a little sparkle? Add some plain seltzer or club soda to the sangria to give it a bit lighter, bubbly taste. If on the odd chance you have any of this tasty Tropical Fruity Sangria left at the end of the day, be sure to put it in the fridge to keep it cold and prevent the fruit from spoiling. After 3 days, it is best to discard what is left; but truthfully, do you really expect to have any of this summer favorite left? I didn’t think so. Slice the fresh oranges, blood oranges, cherries, lemons, limes and kiwi into manageable slices. After that, grab a big pitcher and place the fruit on the bottom. Pour in all remaining ingredients. Pop into the fridge to get cold and delicious. Now all that’s left to do is call some friends, get out some glasses and prepare to get a much-needed taste of summer. 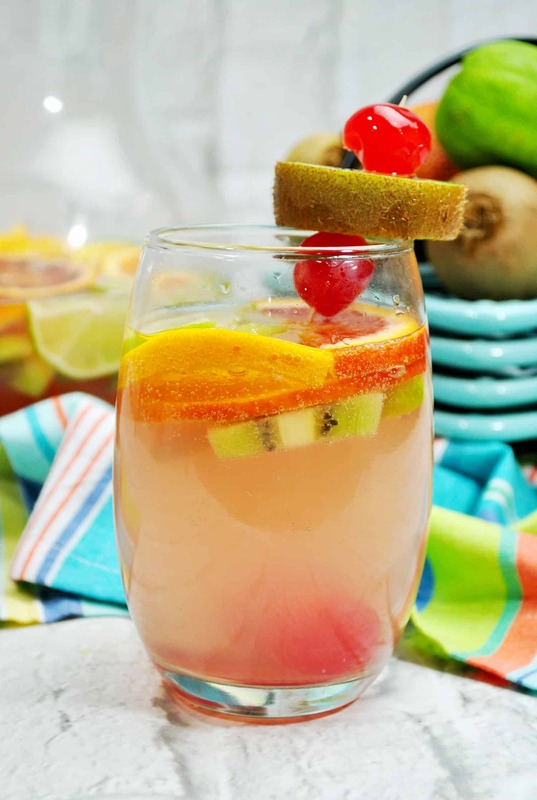 Delicious, refreshing white wine sangria with pineapple rum, citrus fruits and kiwi. Combine all ingredients in a large pitcher and chill until ready to serve.